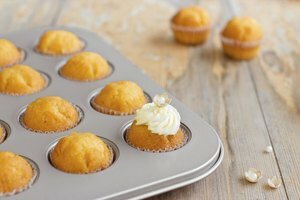 Paper baking cups can replace butter or oil in a muffin tin; they prevent your muffins or cupcakes from sticking to the tin and crumbling into pieces when you try to remove them. In addition to making it easier to remove the muffins from the pan (not to mention washing the pan later), the baking cups will help keep the muffins moister than they if you just used the muffin tin. You can select paper cups that have a color or design that complements the color of your muffins or fits the theme of the event where you will serve them. Separate the paper baking cups from each other. These cups tend to be very thin, so it can be easy to accidentally select two or three when you are only trying to use one. Rub the top of the cups between your finger and thumb to separate them and ensure that they are single rather than doubled or tripled. 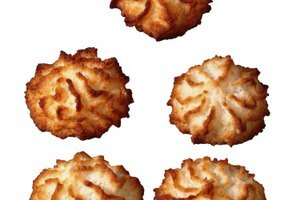 Place one paper baking cup in each section of the muffin tin. Fill each of the paper baking cups approximately 2/3 full of your muffin batter. 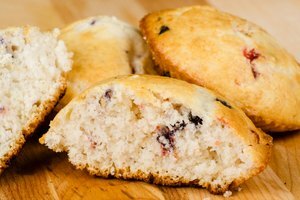 Wipe any spilled batter from the top of the muffin tin with a paper towel to avoid burning it. Bake the muffins in the paper baking cups according to the time and temperature dictated by your recipe. 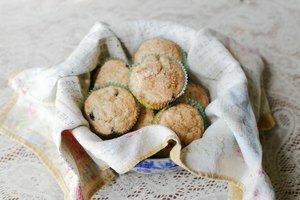 Allow the muffins to cool slightly before removing them from the muffin tin. Serve the muffins with the paper baking cups still attached. This allows people to hold onto the base of the muffin while they eat it without breaking or crumbling the muffin. 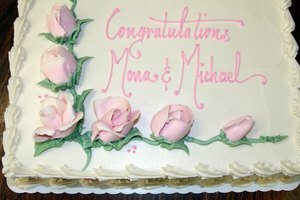 If your guests prefer not to use the paper baking cup, they can easily peel it off.